Read, Jan. The Moors in Spain and Portugal. London: Faber and Faber, 1974. D. Fairchild Ruggles, “Alhambra,” in Encyclopaedia of Islam, third edition. Leiden: E. J. Brill, 2008. D. Fairchild Ruggles, Gardens, Landscape, and Vision in the Palaces of Islamic Spain, Philadelphia: Pennsylvania State University Press, 2000. D. Fairchild Ruggles, “The Gardens of the Alhambra and the Concept of the Garden in Islamic Spain,” in Al-Andalus: The Arts of Islamic Spain, ed. Jerrilynn Dodds. New York: Metropolitan Museum, 1992, pp. 162–71. D. Fairchild Ruggles, Islamic Gardens and Landscapes, University of Pennsylvania Press, 2008. Stewart, Desmond. The Alhambra. Newsweek Publishing, 1974. ISBN 0-88225-088-4. The World Heritage. Istanbul and Cordoba, Vol. #15. Film Ideas, 2008. ISBN 1-57557-715-1. 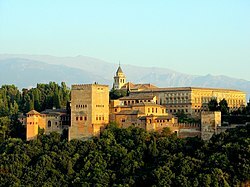 Alhambra in turgranada.es Official site for tourism of the province of Granada. The Alhambra in Granada, Spain Masterpieces of Islamic Architecture. ↑ "The Alhambra - historical introduction". Retrieved 2 January 2013.